Lucindaville: What's Wrong With The Picture? It seems that unbeknownst to me, one of the chickens has been sneaking in through the cat door and laying eggs in the cat napping chair. I found out last week when I noticed the eggs. 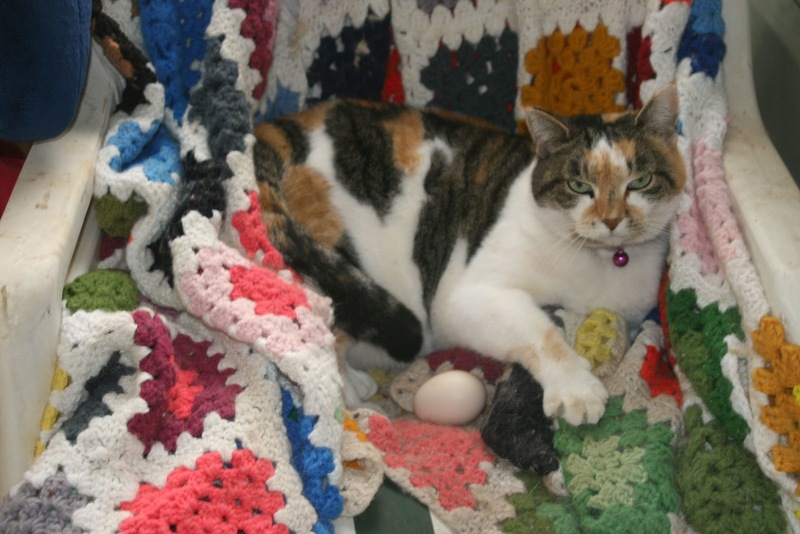 Yesterday, when I was heading to the laundry room, I found Kitty Carlisle napping with an egg. You will notice, as I took the picture, the claws started to come out. I wasn't sure whether she had decided to hatch the egg or eat it later. Either way, she did not me to have it. Love the way that Kitty Carlisle is camouflaged with the afghan. This picture of Kitty Carlisle and her egg just makes me happy! You must have a very determined chicken. I've had a mother raccoon and her three babies come inside but never a chicken. It rained yesterday, so the cats had to stay in. When I got home, they ran out and before I could get in the house, the chicken ran in and promptly laid an egg in the chair. It is nice to have such door-to-door delivery!